We were recently approached to review a couple of items from Spartatarp, they were a tarp and a hank of paracord. These items were sent to us so that we could perform an independent review with no bias. I have use this tarp over the past month each weekend and this is how it performed. It's in a nice red carry bag with a cool logo, the tarp itself is black, and is roughly 10ft by 9ft and it also comes with some short but quite thick alloy pegs. It's got 19 attachment points, 16 around the edge and 3 along the ridge but the thing that makes it a little different from other tarps is that the corner attactments are regular webbing but all the other attachment points are heavy duty 15mm elastic webbing. Now this is a clever design as it adds in a touch of suspension when the weather is against you and the wind gets up. Also for the weight conscious amongst you it comes in at a mere 600g !! The logo is prominent and only on one corner and while this may discourage some people, I think it looks quite cool. The fabric it's made of is lightweight ripstop nylon with a waterproof coating inside, it's very nice looking fabric having the same look as the carbon fiber scales you'd find on a top quality knife handle. If you know ripstop then you'll know this will be a tough and reliable material that should last. Here you can see the underside of the tarp, the crosshatched weave and the waterproof coating, it's looking very impressive so far. The webbing tabs are reinforced with a woven polypropylene layer taking the strain off the main tarp and distributing it evenly across the corner, but as you have elastic webbing tabs too, any extra tension put on the tarp through extreme weather conditions or even by tripping over the guy ropes should be easily absorbed resulting in fewer stresses on the fabric and attachment points. ..and it did, very well. The water bounced off the fabric easily and beaded beautifully as it wiggled and wound it's way down the fabric and onto the forest floor with not a single drop penetrating the material, very impressive and it certainly gave me the confidence to use this tarp during any torrential storm I may be out in. Above you can see it pegged out with just 4 pegs, one at each corner, a ridge line running under and fixed with two prussic knots to keep the tension. All in all it makes for a superb piece of kit, one that I'd be happy to carry with me and rely on, especially due to it's lightweight and great fabric construction. So if you are searching for a new tarp, contact Calum at SPARTA STORE and give serious consideration to this tarp, I don' think you'll be disappointed. I'm not, by nature, a superstitious person although there are a few rituals I abide by like asking the elder before taking her flowers or never bringing blackthorn blossom into the house, but when it comes to blade-lore I'm very superstitious and I think a lot of knife users are just the same. 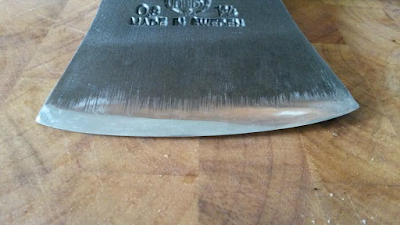 I've collated some of my favourite adages about knives, some are simply common sense, some are proper knife etiquette (which a lot of knife users no longer practice and it's a sad sight to see) some are purely folklore but all I find very interesting.. 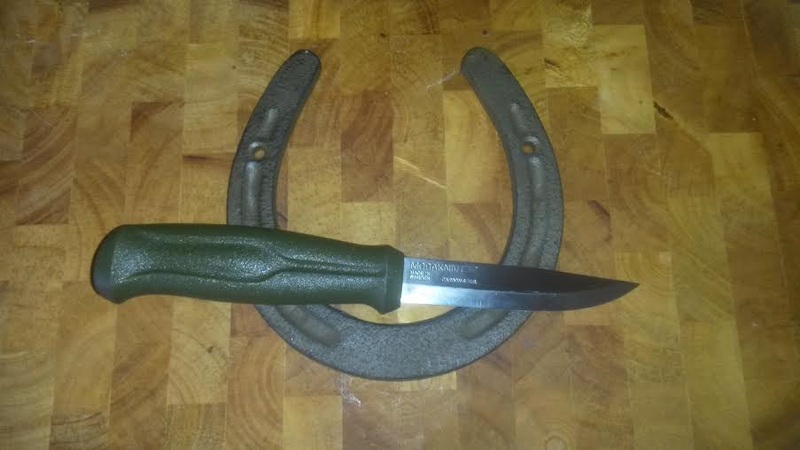 Some knife superstitions are, unusually, very similar in different cultures around the world whereas some are country specific but all should teach us good manners and respect for our favourite cutting tool. Although I haven't placed them in any specific order the first one is, I believe, the single most important superstition in all blade-lore. 1. NEVER ever ask for a loan of some one else's knife. 2. A knife, according to a woodsman, never cuts, it bites. 3. A knife never truly belongs to you until it has drawn your blood. 4. A knife with a black handle keeps away fairies and bad spirits. 5. A knife, given from a lover, means the relationship will soon be over. 6. If someone gives you a knife a coin should be offered in return, in Ireland this is usually a copper coin. 7. If you drop a knife someone else should pick it up otherwise it's bad luck. 8. Never leave a knife sitting with the edge facing upwards or the fairies will cut their feet when they land on it. 9. If a knife falls and lands on it's left side a woman is coming to visit, if it's the right side it will be a man. 11. Never cross your knife with another piece of cutlery at the table, it is bad etiquette. 12. A knife under the pillow of a pregnant woman will ease the pain of labour. 13. A knife under the marital bed will produce a son, a skillet will produce a daughter. 14. Never close a folding knife unless you are the one who opened it. 15. If someone willingly passes you their knife they are also passing their soul and the knife must be returned just as it was given. 16. Sharpen a knife by the light of a full moon and it will never go dull. 17. If, while using someone else's knife, it bites you, quickly wipe the blood from the blade and whisper a charm or the knife will cut everyone who uses it afterwards. 18. If a knife cuts you 3 times in a row it must be washed in real spring water to wash away the evil. 19. To pass a knife to a friend, lie it on the table then let them pick it up, it should be returned this way too.. that is proper knife etiquette. 20. Tap a horseshoe with the blade of a knife 3 times to make the knife lucky. 21. A knife stuck in the mast of a sailing ship portended good luck, fair winds and a safe journey. 22. A bride and groom use a knife to sever old ties, past relationships and create a clean break to ensure a long life together. 23. A knife stuck in the lintel of a door offers protection to those within. 24. Never lick food from the blade of a knife as it's an insult to the cook. 25. If a knife is leant to a woman she must kiss the blade or lie it against her bosom as a thank you otherwise it will bring you bad luck. 26. A knife forged in fire is pure, a knife ground in water is soul-less. 27. To make a knife oneself then offer it to a friend to keep is to offer a true and eternal friendship. 28. A knife drawn from a leather sheath must always cut something before being re-sheathed. 29. In Ireland, a knife used to cut a fairy thorn must be destroyed as the blade then contains the anger of the fairies. 30. A broken knife should never be repaired it should be buried so the steel can rust and it can return to the earth from whence it came. 31. Tap a knife 3 times on a church door to bless it. 32. Tap a knife 3 times on a gravestone to curse it. 33. If you find a knife it must be cleansed from the previous owners essence by washing it in rain water or bathing it in moonlight. 34. A knifeless man is a lifeless man. 35. If you no longer want a knife never pass it on as this passes on the feelings of resentment, always bury it. 36. A knife that does not hold it's edge should be left in a hawthorn hedge for the hedgewitch to take. 37. A knife should always be sharpened by it's owner, if someone else sharpens it the knife will seek to be owned by that person. 38. A knife made of animal bone will give the maker the attributes of that animal. 39. When you have finished using your knife always re-sheath it, never leave it on the ground or stick it in a tree as this will bring misfortune. 40. A Knife made from steel from the earth should be sharpened with a stone from the earth. 41. Casting a knife into a stormy sea will cause the storm to abate. 42. If you carve the spoon you eat with, with the knife you own, you will never be hungry. 43. If you drop a knife and there is no one else there to pick it up, you must tap it 3 times on the heel of your shoe to knock out the bad luck. 45. A knife thrown in the air can be stolen by the fairies before it hits the ground. 47. Leaving a knife unsheathed all night will bring the owner bad luck. 48. To cut someone else with a knife either accidently or on purpose is to bring a curse on your family. 49. A knife placed in a coffin will ensure the departed rests peacefully. 50. According to the Sami people brass should always be used in a knife to bring good luck.